Through processes of optimization and organization, US architecture firms such as Skidmore, Owings & Merrill LLP (SOM) have claimed to produce the best, for the most, for the least – what OfficeUS calls architectural “Superlatives.” Since the firm’s emergence in 1936, SOM has been the architectural office synonymous with the term “corporate” in its practices. 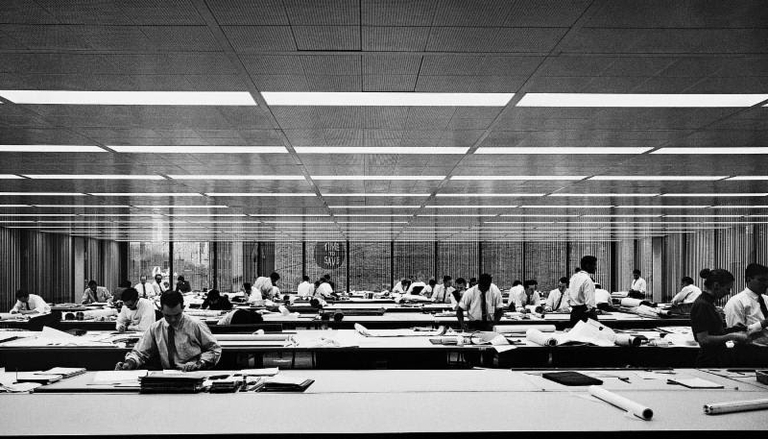 Modeled on many of the same managerial principles of its corporate clients, SOM applied strategies such as decentralization and specialization to architectural practice. Despite its scale, SOM has represented a unique combination of design authorship and pragmatic acumen. The firm has a large presence in the OfficeUS Repository, which chronicles the story of U.S. architecture built abroad. SOM Design Director Kent Jackson, and SOM Structural and Civil Engineering Partner Bill Baker joined OfficeUS Partners for a one-day workshop that aimed to give an overview and specific insights on different scales and scopes of their architecture projects – from the aesthetic to the material to the technical to the managerial.